The Lord has a new wine for us that is unlike the old wine in many ways. It's the new wine of the Spirit. When Jesus was baptized in water, the Holy Spirit descended upon Him in the form of a dove and remained. After he was in the wilderness for forty days, being tempted by the devil, he returned to Galilee in the power of the Spirit (Luk 4:14). He read from the prophet Isaiah, declaring that the Spirit of the Lord was upon Him to preach the good news to the poor, proclaim release to the captives, recovery of sight to the blind, to set free the oppressed, and proclaims the year of the Lord's favor (Luk 4:18-19). We all know that wine is made from crushing grapes, releasing the juices. Then the juice is fermented, so that it converts to alcohol. This process of fermentation releases gases as the chemical process occurs. This process takes time, and while it is happening, there needs to be a place for the gases to go. Greek: G4486 rhēssō - hrace'-so - break (forth), burst, rend, tear. See Luk 5:37. Old wineskins will easily crack, if they are put inder high pressure from gases of fermentation. So nobody would ever put new wine into old wineskins. Instead, the new wine should be put into new wineskins. The new wine represents the Holy Spirit and his operation. This will never fit into the rigid forms of godliness and old structures of traditional religion. If we attempt to do so, it would result in a burst and spillage, since the old forms could not contain it. Although the disciples had been fishing all night, they knew Jesus had power and authority, so they obeyed when He told them to put out into the deep water and let down their nets. Jesus said to Simon, "Do not fear, from now on you will be catching men." (Luk 5:10 NASB). So this miracle was meant to illustrate how the Lord will enable us to catch men for Him. It’s a picture of bringing souls to Christ, under the power of the Holy Spirit, in obedience to the Lord’s command. It’s in contrast to the old, traditional church system and way of operating. After Peter got the new wine on the Day of Pentecost, he preached and the Holy Spirit brought thousands of souls into his net for Christ. The new wine breaks old nets. Although Jesus told the leper, after he healed him, to “tell no one,” the news about Him spread even farther. The new wine breaks through all barriers to the spread of the gospel. I remember once when I was in the small village of Gradina, Bulgaria back in 1993. This was soon after the fall of communism. I was part of a Spirit-filled missions team that was ministering there, and I was privileged to be the one to preach on that occasion. The house where I was preaching was full, and the people outside removed the windows, so they could stand outside to watch and listen. All glory to Jesus! It was not about me, since I was completely unknown to the people of this village. During Jesus ministry, there was a paralytic man whose friends heard that Jesus was healing people at a certain house. So they brought the paralytic to the house, but could found the place full of people, and the entrance blocked. Due to the crowds, the desperate people made a hole in the roof, so they could let their friend down in front of Jesus. The new wine is like this. It bursts buildings. People will make a new opening in the building to get some of the new wine. Matthew Levi, the tax collector followed Jesus, and all his sinner friends wanted to do the same along with him. It was not typical or accepted for a rabbi to keep company with such sinners. The new wine breaks all those man-made social barriers, so that sinners will be attracted to righteousness, getting radically saved, and bringing many of their friends into the kingdom. The word "tear" here comes from the Greek: schizō - skhid'-zo - break, divide, open, rend, make a rent. See Luk 5:36. This word "skhidzo" is also used in Luk 23:45: “the veil of the temple was torn in two.” The veil was part of the old, and could not contain the new. So the new wine is like a new piece of cloth, which will shrink when it is washed. If it is sewn to an old garment, then when it shrinks and the old garment doesn't shrink with it, this will cause the new cloth to tear. Besides, the color of the new will not match, since the old cloth is faded and the new is not. So the new wine or new garment doesn't fit at all with the old. This new wine is so much better than the old wine, however, those who have already tasted the old wine prefer that to the new one. 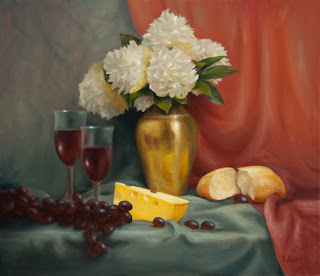 But for those who have not tasted the old wine, when they taste the new one, they leave everything for it. The disciples Peter, James, and John did this. “When they had brought their boats to land, they left everything and followed Him.” (Luk 5:11 NASB). They had the best day ever in their fishing business, and that’s the day they left all that to follow the Lord. This new wine cannot be put into old wineskins. It makes old wineskins burst, old garments tear, and old nets break. When we follow the Lord obediently in the power of the Spirit, it will make holes in the roof, because the old entrances will not longer be big enough. It will burst buildings, so they cannot contain it. It will also break down man-made, religious barriers that keep sinners from coming to Christ, and will break all barriers to the spread of the gospel. This new wine flows from the Father in heaven by the Spirit, so you have to stay connected to Him through the Lord Jesus Christ. It means that when the Lord is doing amazing things through you, that are blowing everyone away, you have to get alone with the Lord in prayer to seek His face. Don’t settle for the old wine, although it may taste good and make you feel good. Cry out for the new wine that is much better and more powerful beyond all comparison. Attribution notice: Most Scripture quotations taken from the NASB. The "Celebrate the Bloom" fine art © 2013 is by Dee Lessard. All rights reserved by the artist. 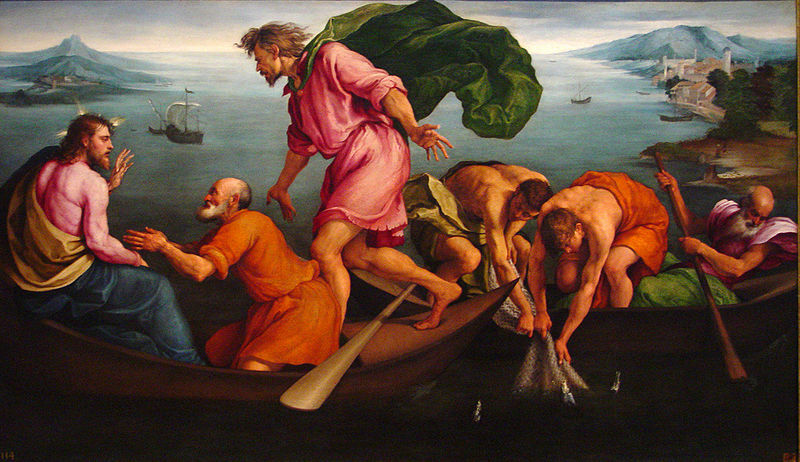 The "Miraculous Draught of Fishes" image from the Wikimedia Commons is a photograph by Alexander R. Pruss of an oil on canvas painting by Jacobo Bassano in 1545, which is in the National Gallery of Art, Washington, DC, USA. 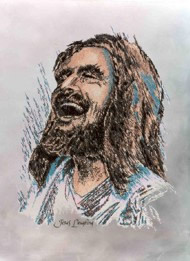 The "Jesus Laughing" image © 2013 is from Praise Prints by Ralph Kozak. All rights reserved by the artist. Author's note: For more about the new wine, also see "Baptized with the Spirit" and "Holy Fire Baptism." If you enjoyed this post, you may also access my complete blog directory at "Writing for the Master." Praise The Only Good God in heaven! I have wondered and wondered exactly what Our Master meant when He spoke of old and new wine and wine skins... I also was concerned for the Word says the devil steals away what Word we do not understand in the Parable of the Sewer. Now, I know. This is a direct answer to prayer. I had Googled "Holy holy holy" fond a pic I liked that is on THIS page that answers my "Father, please help me understand what yout holy Son meant when He taught this teaching. In Jesus' name, Amen"
Hallelujah! Thank you Father God. Thank you for posting this! May you be blessed in the Lord God Almighty, and this seed sewn bring forth fruit even an 100 fold! Yay! Dear sister Amber, what a great testimony! Praise the Lord, who causes all things to work together for good to those who love Him and are called according to His purposes. Please consider applying for enrollment in our discipleship training school, which is a distance-ed, 3-yr course of study, conducted online. You can find more at http://doulostrainingschool.blogspot.com/2015/08/doulos-training-school.html. Shalom!